Firstly my apologies for inactivity on Meateaters. I have had a month away from work looking after my boys which, if they were a bit older, would ordinarily mean that I could dedicate time to adding new recipes. As it turns out I had plenty of time to cook, but no time to blog. But – here is a recipe worth waiting for. This is another Jamie Oliver recipe. I make no excuses for this – this particular one is a show-stopper – which you might be surprised by when you read the rather tame ingredients. 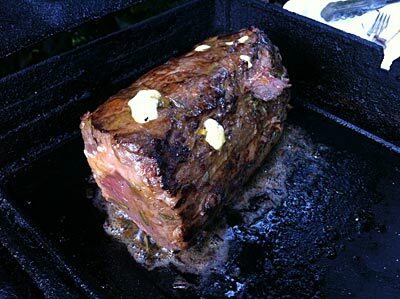 While the recipe suggests beef fillet I, and the friends who have subsequently tried this dish, all used a scotch fillet roast. A good 800g piece of scotch fillet will set you back about $20-$30 but it well worth it. The basic premise of this recipe is to blacken the outside of the fillet as quickly, and as much as you can stand, and then to slowly cook the inside to your taste and liking. There is something exquisitely mouth-watering about blackened, almost charcoaled meat with the flavours of the marinade baked onto the outside while having medium rare and tender meat on the inside. Put all the ingredients, except for the butter, into a plastic lunch bag, or kitchen tidy, with the meat. 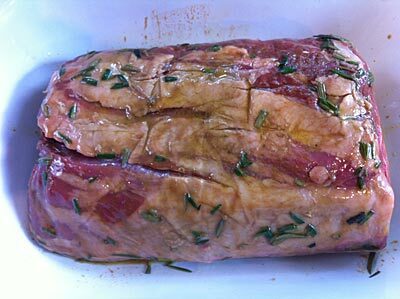 Massage those ingredients into the meat, then squeeze out all the air and leave in the fridge overnight. If you don’t have that much time three or four hours will do. Before you cook the meat bring it to room temperature. Jamie says to pat the meat dry with paper towels but I ignored this. I like my way better. Preheat your barbecue – or you could do it on a really hot pan on the oven top but it’d make a mess and it’s kinda nice doing it outside in a rustic manly way! Roll the fillet in olive oil and place it on the hottest hottest part of the grill. As you cook it at this high heat rub butter into the meat, turning every minute. Get the whole fillet as dark as you can stand it. Keep on rubbing butter in. This might take you anywhere from 8 to 15 minutes, maybe longer. The thing you are trying to do is quickly blacken the outside without cooking the inside. Once it looks dark enough move it to a cooler part of the grill and cook slowly to your liking. 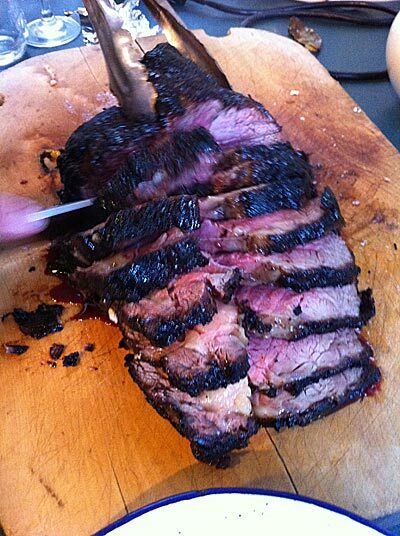 Use the pressure test to judge how well the meat is cooked. Then remove and cover to let rest for ten to fifteen minutes. Before serving you can rub more butter on it, and drizzle more worcestershire sauce and olive oil over it for serving. My friend Pete cooked this for a group of eight last weekend and he used around 300g of butter to do this dish! I have done it with less, but it’s bloody nice the more you use. This will win you friends if you cook this for people you have never cooked for.